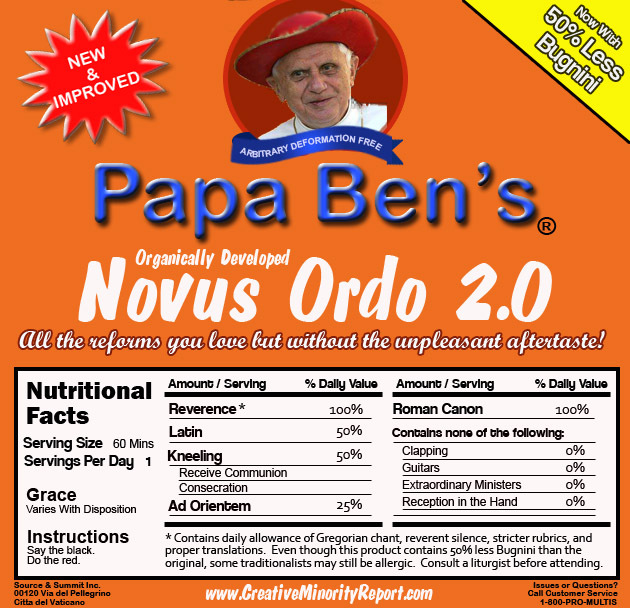 A day or two ago I came across what I thought was the best piece of satire so far this year, in the form of a bogus label for a new Novus Ordo. Now there are lots of people who call themselves "traditional Catholics," ranging everywhere from those who attend the Novus Ordo without clowns, through the Latin Mass wannabes, to those who actually practice the catholic Faith. I don't normally go to the Creative Minority Report.com site, so I don't know where they are coming from or where they are headed with the "Papa Ben's" page, but it is certainly worth seeing. Pope Benedict XVI is said to be preparing a significant reform of the Novus Ordo. My guess is that it will be purely cultural, will address the doctrinal problems of the Novus Ordo only accidentally if at all, and will not address any of the doctrinal or moral problems of the New Order. No matter what perspective the folks at the Creative Minority Report hold, the label makes some interesting admissions about the "product" the Pope is seeking to improve. In the upper right hand corner we are told that the new product contains "50% Less Bugnini." "Bugnini" is not the Italian word for "cholesterol" or "calories." Bugnini, of course was the Grand Architect of Pope Paul VI's Novus Ordo Missæ. Archbishop Annibale Bugnini, a reputed Freemason, cobbled the Novus Ordo together with the help of several Protestant ministers. "50% Less Bugnini" but one has to wonder why it isn't "100% Less Bugnini." After all the Roman Rite flourished for many centuries with "0% Bugnini." One of the folks who commented on the Creative Minority Report page, Christopher M. Tomaszewski, wrote: "Only 50% less Bugnini? I'd rather not have my Roman Missal even manufactured on the same equipment used to make products containing Bugnini..."
I guess that "Arbitrary Deformation" is the Holy Father's term for clowns in the sanctuary, demons handing out hosts, offertory dancers, and other things that Catholics generally refer to with obscene adjectives. The blue banner could use a little work though, to make sure no one takes it for "Arbeit macht frei"—particularly with the smiling German face above it. Papa Ben's claims to be "Organically Developed"—something that nobody could say about the Bugnini product. It is a natural thing for liturgy to change very slowly over time. One can see changes in the history of the Roman Rite and in the other traditional Catholic rites. But "very slowly over time" is the key phrase—little bits and pieces added here and there. 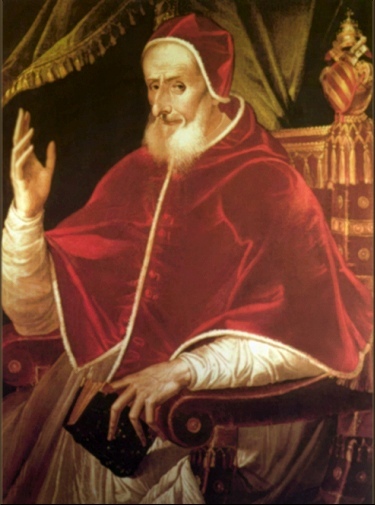 Pope Saint Gregory the Great introduced the Kýrie in the sixth century. From the Antiochene liturgy, the Agnus Dei was added by Pope Sergius I (r.687-701), a Syrian by birth. The Credo, introduced in 1014 at the request of Emperor Henery II had been chanted as part of the Gallican Mass (even containing the Filioque, previously forbidden at Rome). The elevation of the Host and Chalice were added around the 13th and 15th centuries respectively. The Communion prayers and the last Gospel weren't added until the 16th century. As some things were added over the centuries, others were removed for good reasons: Communion in the hand, Communion under both species, and the exchange of the Kiss of Peace with the congregation. Quite the opposite, the Bugnini rite was cobbled together in a few years, incorporating elements foreign to Catholicism, and adding back things the Church had discarded for good reason over the centuries. The traditional Mass rarely runs 60 minutes on a weekday—unless, of course, it is being offered more as art than worship. In the real world, few people have time to hear Mozart each day at Mass. And preferring Mozart to Dylan does not make one a Catholic. Grace will vary with disposition, but also with validity. All of the questions about the validity of the "Indult Mass"—perhaps more—remain for Novus Ordo 2.0 . "Say the black and do the red" ought to be "pray the black...." If anything was dis-edifying about the way Mass was said by many priests before Vatican II it was the reliance on "ex opere operato"—that if they just ran through the formula correctly the Mass would be effective with very little attention on their part. Above all other prayer, the Mass ought to be prayed clearly, distinctly, and with deliberation—not like a tobacco auction. "Reverence, kneeling, Latin, and ad Orientem" have indeed been missing from the Bugnini Mass in practice, but not in theory. All of those things could—indeed should—have been practiced in Novus Ordo 1.0. Perhaps they will be practiced at the papal court, but what about in Los Angeles, Chicago, Paris, and the other liturgical low-lights of the world? What will guarantee their return to the congregations in bowling jackets, tank tops, and shorts? "Roman Canon 100%"—I doubt it. The Holy Father himself, when not wearing his Papa Ben superhero suit has been known to use the other "approved" and unapproved Eucharistic prayers. Do we really expect the attendees at the Saturday evening "get-it-over-with-Mass" to put up with an extra seven minutes of Canon before they go out partying? "Clapping, guitars, extraordinary ministers, Communion in the hand 0%"—Also unlikely. Pope Benedict just loved the clapping at Yankee Stadium and Saint Patrick's Cathedral. They say he is now distributing Communion only in the traditional manner (did someone lift his watch at the stadium? ), but that is to small groups. Do we really expect that for the thousands of communicants who often attend his Mass. And what about the other Churches of Novusordodom? 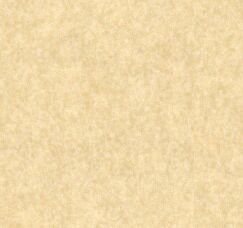 There are a lot of ladies out there who are "Eucharistic Ministers," "commissioned" as such, and who don't see anything extraordinary about what they do. "Chant, reverent silence, stricter rubrics, and proper translations." Yes chant, but because it is prayerful and not as a demonstration of artistic sophistication. Not really silence, for the prayers of the Missal are never really silent except for the moméntos, but a calm, devout, and ordered succession of prayers in their proper voices. Rubrics not ignored or ad libed. "Proper translation" deserves a word by itself. When the very first English translations of parts of the traditional Mass (100% Bugnini-free) were issued, we were horrified. They were so banal that the bishops just had to have hired the Back Street Boys to produce them. We were told that they were done in haste and that things would improve with time—generally a lie. Any of the hand missals available in the 1950s would have served infinitely better—the Saint Joseph, the Father Stedman, the Maryknoll, the Marian, the Father Lasance, the Saint Andrew—and none of them were unable to correctly translate "pro multis." 1-800-PRO-MULTIS. The folks at 1-800-Mattress assure us that the telephone phone network will deal with eleven digits dialed, and that the last "s" is for "savings." Papa Ben's might consider making it "s" for "salvation." But, here again, this is not one of those thing that the Holy Father gets right either—in spite of the Vatican's insistence that English speaking world should take no more than two years to prepare the faithful for this essential change to Novus Ordo 1.0 The deadline is fast upon us—17 October 2008! Two missing ingredients: Authentic Catholic Doctrine. Authentic Catholic Moral teaching.